Because of this tweet, I created something new in my classroom. Students were always writing their names on the board which while working with students is difficult to view. Now I will have the spreadsheet of the checkout sheet as a tab that I can quickly reference on my computer which is right next to me. UPDATE: I have added another QR code so that as they return to my room they scan it and complete a quick form so that I know the exact time they returned. 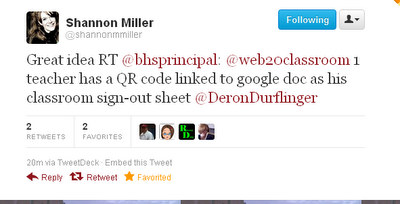 QR codes were created in Google URL shortener. Love the fact that the form gives a time stamp. No more taking time to write that down! The QR code goes directly to a Google Form that I created!